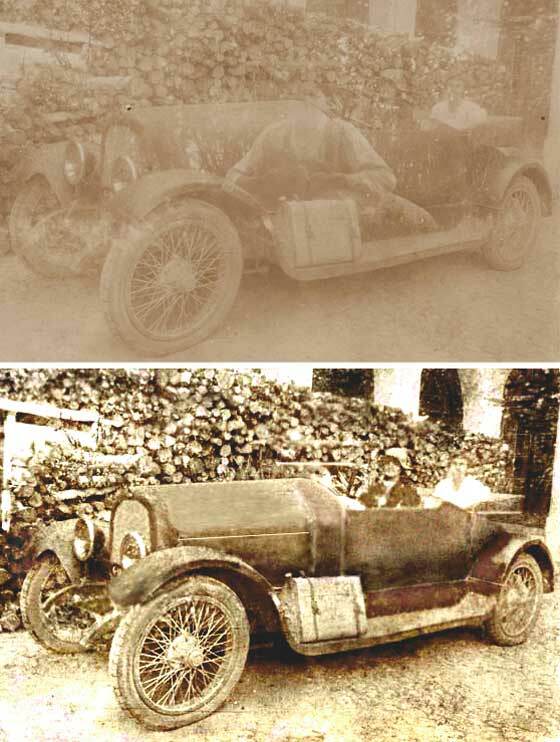 A couple of photos received from Roger Paine (Canada), the other we are still having some difficulty in investigating. 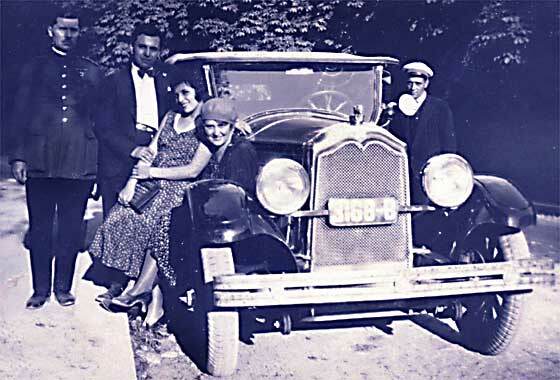 He also sent us this older photo of his grandparents under which his mother had written "possibly a Benz". -- Mother was quite right as this was indeed a cca 1898 Benz Velo. Karl Benz made the first petrol engined car to run successfully. 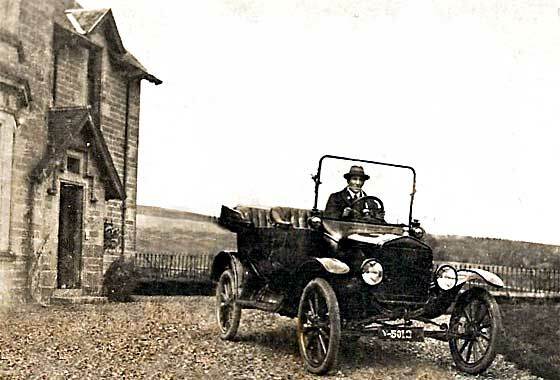 The first four wheel car the Victoria appeared only five years before the car in the photo was made! Lighter Velo started 1894. Two photos received from João Ferreira (Portugal) taken in Lisbon circa 1902. The first photo is titled "Av. 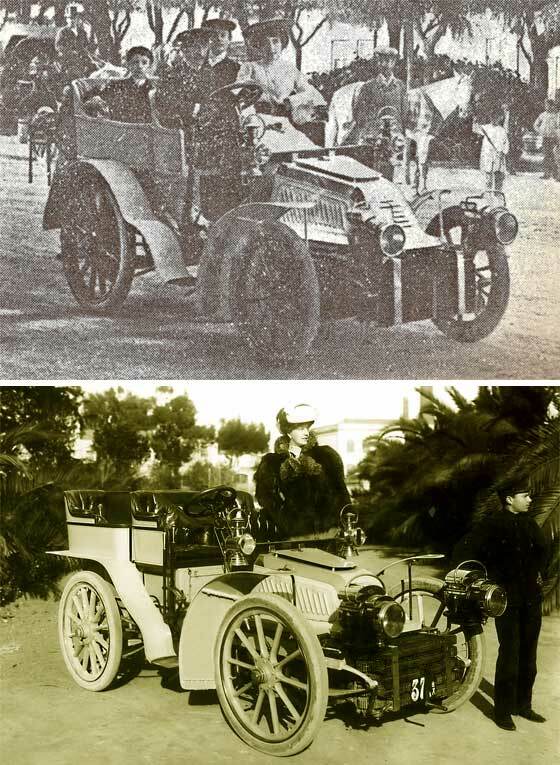 da Liberdade 1902" and the second photo shows the reg LX-37, municipality of Lisbon, number 37. Could be Mors? 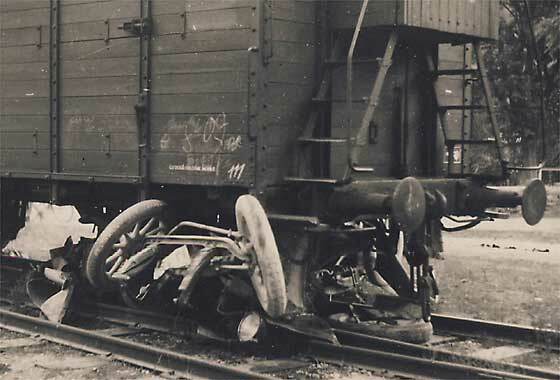 -- While I had some reservations, our John Warburton agrees the cars are 1900/1902 Mors Rear Entrance Tonneaus. He feels the blurry photo shows a 1900-01 car and the the other a 1902. Cars were rapidly evolving so differences likely as cars were built on an individual basis. One more of a number of photos received from Cicos Florin in Constanta by the Black Sea (Romania) who is interested in old cars of Romania and Constanta. Photos originate from Busteni near Brasov. -- From the badge on the rad this is quite obviously a French Berliet made near Lyon. The only problem is that the radiator style does not match the body style. The radiator with narrow top side boarder says cca 1908 Berliet,- which was later re-bodied with round bulkhead in cca 1911/12. Lovely period photo received from Sherman Warner from Hawai'i (USA) of a car photographed in Pahala which was a sugarcane plantation on Hawaii having a sugar refinery. Sherman thought the car may be a Cadillac. -- Not a Cadillac because Cadillacs generally have a curved top to the rad whereas this one has an angled hard shoulder. Layden at the AACA suggested Locomobile and indeed furter research suggests this is a cca 1910 Locomobile Model M30 Tourer made in Bridgeport, Conn.
One more of a number of photos received from Cicos Florin in Constanta by the Black Sea (Romania) who is interested in old cars of Romania and Constanta. This is a new photos to his collection originating from Orsova while it was not part of Romania. --This looks very much like a 'special'. Transverse springing suggests it is based on a Model T Ford and having non-electric lighting suggests the base car must have been built pre 1915. A difficult photo to identify precisely! 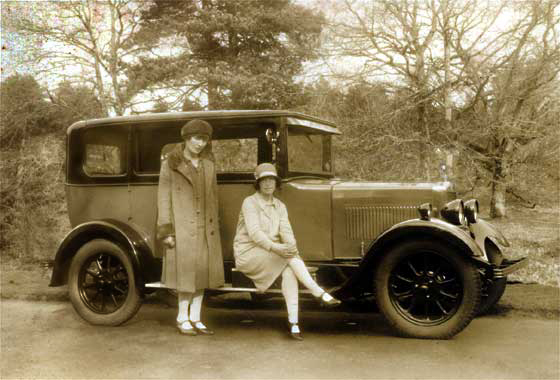 Nice period photo received from Cath McPherson (UK) asking if we can help to identify the car in the attached photograph. 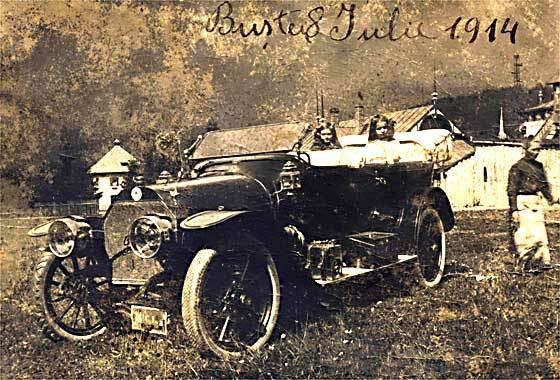 They think it may be her grandfather at the wheel and the photo was probably taken in Lanarkshire. The registration appears to be V-5012. 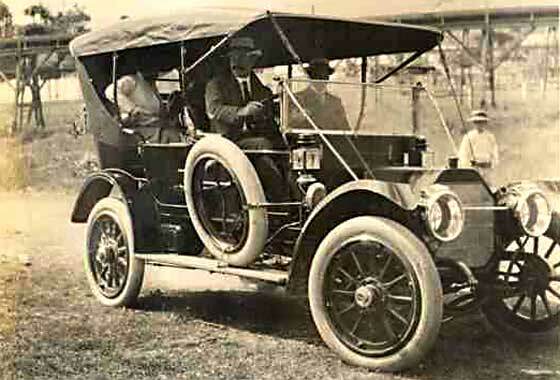 -- Registration V was indeed Lanark County Council cca 1917/18 which ties in with the features of the car which is a cca 1917 Ford Model T Touring. Interesting to note that the car is left hand drive suggesting USA not UK origin. Small definition photo received from Alan Hagstrom of Hugo, Minnesota (USA) asking if we can please help him identify the year and make of the auto in the attached photo for his family archives. We would repeat our request to send photos at BEST RESOLUTION possible, as it is the detail that provides the identification. -- Fortunately it is relatively easy to recognise the make but lack of detail leaves the year a little vague. Demountable rims, 1 man top, so car is a cca 1919 Ford Model T Touring. 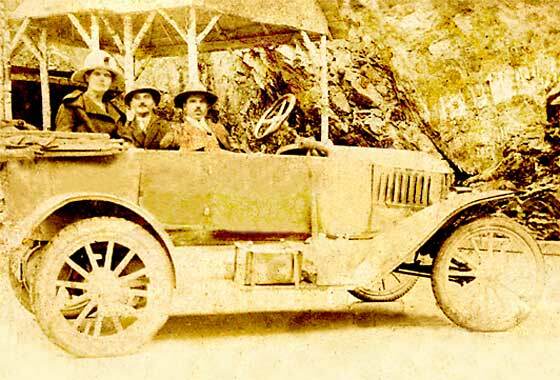 Smashing photo of an unusual car received from Kathy Fagan Rocha (USA) of her Great Grandfather, Charles Frederick Fagan, who was chauffeur to William S. Paley, founder of Columbia Broadcasting System (CBS). 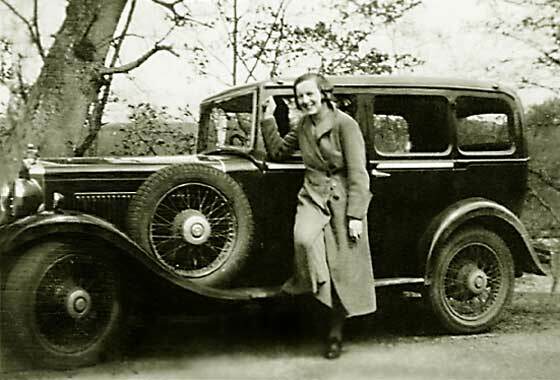 Can we help her identify the automobile please? -- The unusual shape of the headlamps is the prime pointer as to the make of the car. Made in Buffalo USA this is a cca 1919 Pierce Arrow Coupe de Ville. Body could be in-house, but could have been Judkins or Le Baron. One more of a number of photos received from Cicos Florin in Constanta by the Black Sea (Romania) who is interested in old cars of Romania and Constanta. He advises photo is in poor condition -- Indeed it is, having been double exposed. Fortunately the most important part was visible which was the radiator and the curious badge. With the help of Keiser at AACA saying the badge with a 'nose' is a Marmon, further reserach advises it is an American cca 1920 Marmon Model 34 Touring. One more of a number of photos received from Cicos Florin in Constanta by the Black Sea (Romania) who is interested in old cars of Romania and Constanta. -- This is a rather splendid photo which required repairing. It shows an Americam car with very home made seating. Transverse springs identify it as a Model T. Electric lights suggests it must be after 1915 and a little undertray by the starting handle that it was made after 1921. So cca 1922 Model T Ford Special. One of three photos received from John Meriton (UK) saying he has just discovered our site and would like our expertise in identifying and dating the cars. 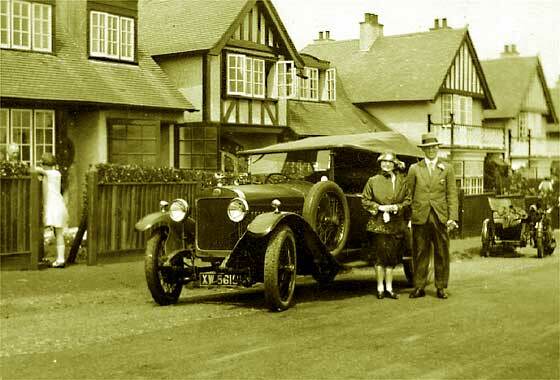 This one shows a car outside great-grandfather's sea-side house, Kingsgate, Kent c. 1926-30. -- Registration XW 561# was issued by London County Council late 1924. The car is quite exotic being French made just outside Paris by a manufacturer who was at the time winning many Grand Prix. It is an expensive cca 1923 Delage DE Tourer. One more of a number of photos received from Cicos Florin in Constanta by the Black Sea (Romania) who is interested in old cars of Romania and Constanta. 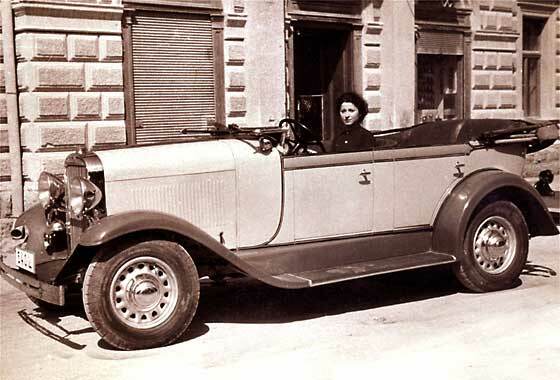 -- Photo shows a rather magnificent car with a splendid torpedo botatil body. The primary pointer to the make is the raised eagle motif of the radiator badge. Fourth largest car manufacturer in France at the time and the first manufacturer to win the Le Mans 24 Hour Race: cca 1924 Chanard & Walcker Sports Torpedo. 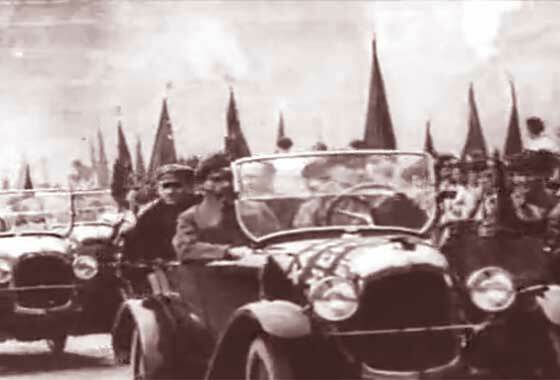 Photo received from Dimitry Dashko (Russia) asking if we can please help him identify the car on a photo taken at a 1925 Military Parade in Moscow. -- The photo has been distorted and needs to be narrowed left-to-right by quite a lot. This is done, the car is a cca 1924 Citroen Type B2 Tourer. Details match: radiator, badge, windscreen shape, petrol filler cap by the windscreen, tierod etc. The mudguards are rounded rather than flat, suggesting 1924. Headlamps seem Cibie rather than Marchal. One more of a number of photos received from Cicos Florin in Constanta by the Black Sea (Romania) who is interested in old cars of Romania and Constanta. Photos originate from Orsova while it was not part of Romania. 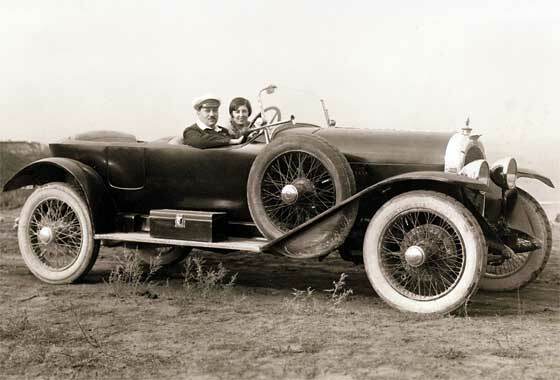 -- Help from friends at the AACA identified this as a cca 1928 Oldsmobile F28T Touring. Same-way-opening-doors confirm year. Interesting to note that the wheels are wrong and would have been changed later presumably for ease of local availability of tyres. One more of a number of photos received from Cicos Florin in Constanta by the Black Sea (Romania) who is interested in old cars of Romania and Constanta. Photos originate from Busteni near Brasov. -- Happy group picture with a chauffeur in the background. American car again, built by one of the oldest US car manufacturers and the foundation of General Motors. Most popular upmarket car of the day. The winged radiator mascot says cca 1927 Buick Maser Six Touring. One of three photos received from John Meriton (UK) saying he has just discovered our site and would like our expertise in identifying and dating the cars. 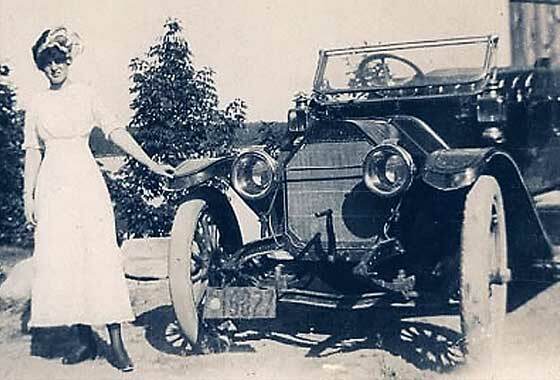 This one shows Great Aunt sitting on running board in the 'twenties, location unknown. 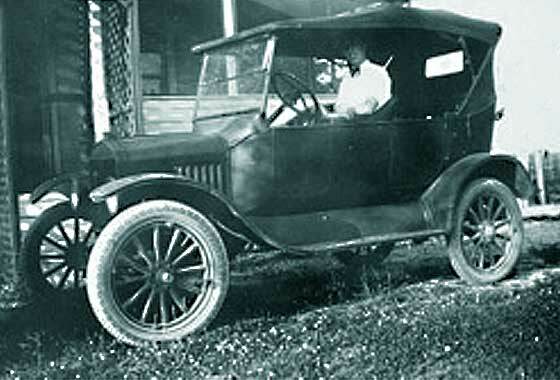 -- Our Chas Moody confirms this is a de-luxe with wiper, mirror, and front wheel brakes cca 1929 Morris Cowley Saloon, three wheel studs and year confirmed by two-tone bodywork available that year; either stone & brown or stone & maroon. 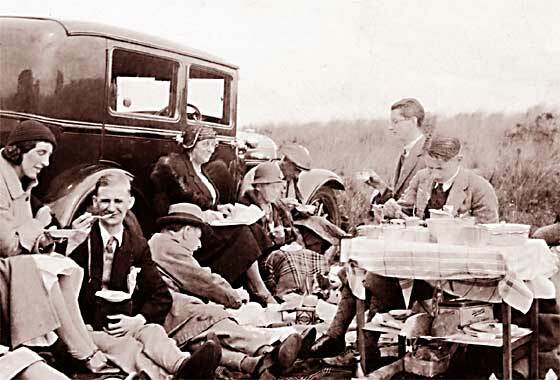 Interesting photo received from Chris Morgan of Sheffield (UK) of a family picnic where his father is having a gentile cup of tea. He spoke a lot about a Lanchester. Could this be it lurking behind the group? -- Sorry no, not a Lanchester. Our Tony Oakes advises it is an American Essex of cca 1928/9. 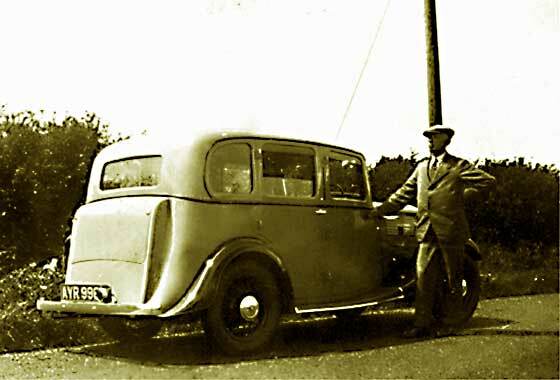 The interesting swage line at the back of the body, only two windows, a double row of louvers and front doors being of the 'suicide type' suggests this is cca 1929 Essex Challenger 4 Door Sedan. One more of a number of photos received from Cicos Florin in Constanta by the Black Sea (Romania) who is interested in old cars of Romania and Constanta. This is a new photos to his collection originating from Orsova while it was not part of Romania. -- Four cow-powered mug plugger from America. Little difficult from the angle of the photo to tell the exact body of the car but from the rear window it looks very much like a truck: a cca 1932 Ford Model BB. Strange wiper? Interesting photo received from Chris Morgan of Sheffield (UK) of a car ran by his paternal Grandfather as a commercial traveller for Hartleys. 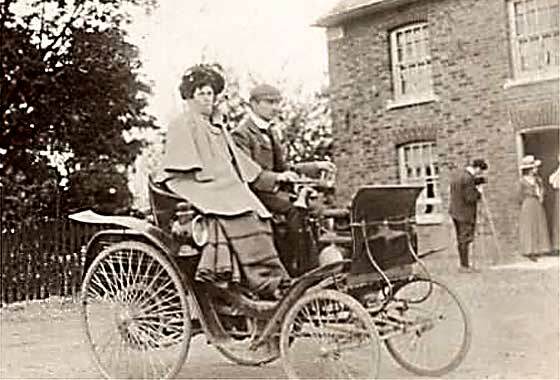 The lady is his Aunt whose driving instruction on a bullnose Morris consisted of the delivery driver taking her once round the block and then getting his train home. Is this a Morris? -- Indeed it is. The precise model was defined by our Chas Moody who spotted the detail on the rear bodywork found only on cca 1933 Morris Cowley Traveller's Saloon. One of three photos received from John Meriton (UK) saying he has just discovered our site and would like our expertise in identifying and dating the cars. This one shows his Grandfather c. 1940s-50s. It is not known where the photo was taken. -- Registration AYR 996# was issued in May 1934. The photo was taken from a difficult rear three-quarter angle and with the front obscured which does not make it easy but our Tony Oakes spotted it as a cca 1934 Standard 12 (16?) Saloon. One more of a number of photos received from Cicos Florin in Constanta by the Black Sea (Romania) who is interested in old cars of Romania and Constanta. -- Lovely family group photo with a very rural mountain backdrop. Car has distinctive American features at the front and strictly European features at the back. With the help of Pepcak at AACA we have nailed this one down to a cca 1935 Opel Six Cabriolet. 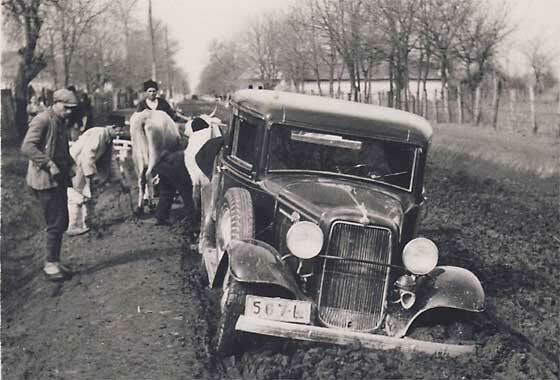 Opel were made in Germany and became fully General Motors in 1931. 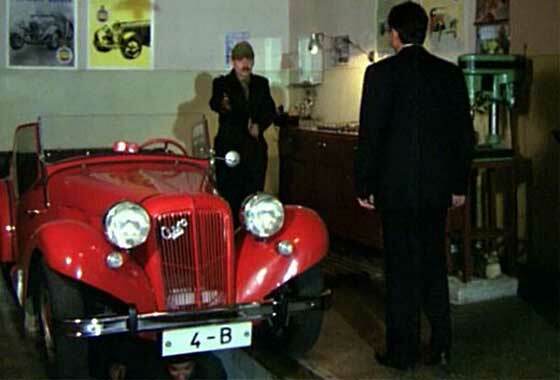 Cinema screen grab of a vehicle which appeared in a Romanian film "Oglinda" made in 1993, where the vehicles are being investigated by IMCDB. Controversial WWII storyline about Romanian royal coup that toppled the dictatorial Prime Minister. -- The car is relatively unusual being built in Prague Czechoslovakia. It is a cca 1935 Aero 30 Sports, quite a popular sporty car 65mph from twin 998 cc engine, front wheel drive and independent suspension. About 3,000 of this car were made. One more of a number of photos received from Cicos Florin in Constanta by the Black Sea (Romania) who is interested in old cars of Romania and Constanta. 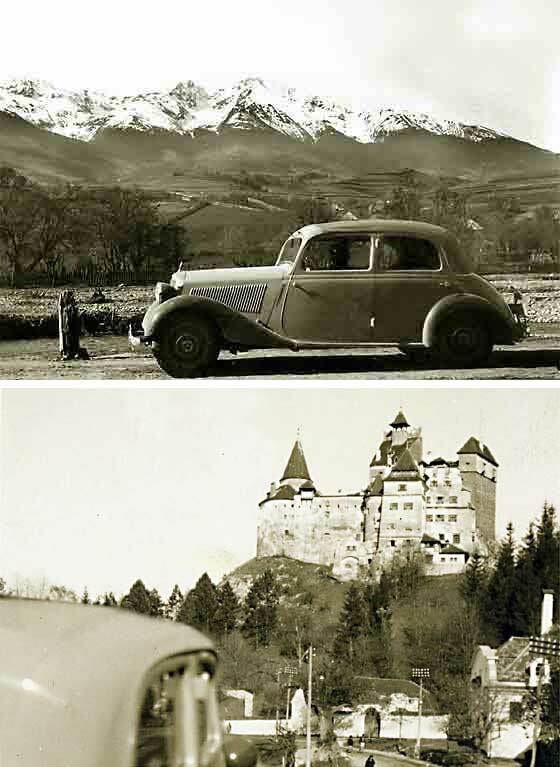 -- Photo taken near 'Dracula's Castle',famous Bran Castle area of Brasov County. Certainly a magnificent mountain backdrop. The car is a little difficult to date because this model was made from 1936 to 1953. 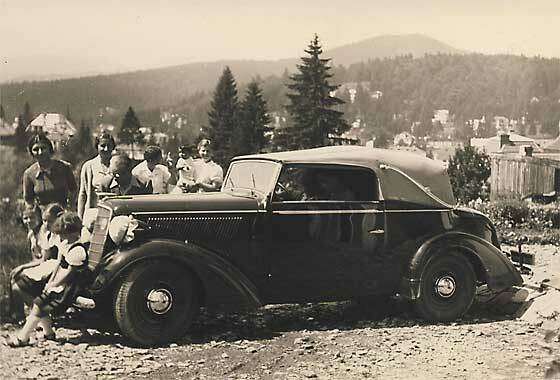 Judging by the indicators being inboard and the cabriolet roof being central, - cca 1938 Mercedes Benz 170 Saloon. One more of a number of photos received from Cicos Florin in Constanta by the Black Sea (Romania) who is interested in old cars of Romania and Constanta. This is a new photos to his collection originating from Orsova while it was not part of Romania. --Another difficult photo to identify precisely! I hope no passengers in the car when it got hit. Few dating pointers. 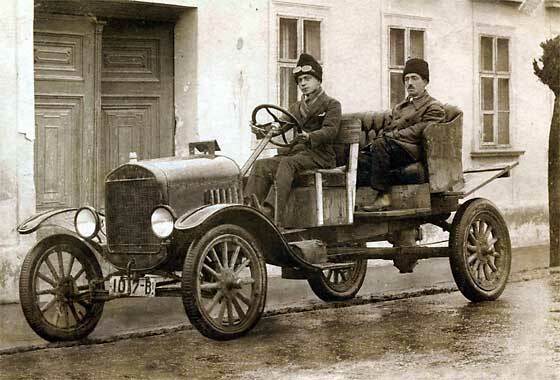 Look wooden wheels, no front brakes but electric lighting so probably soft top tourer just post WW1. 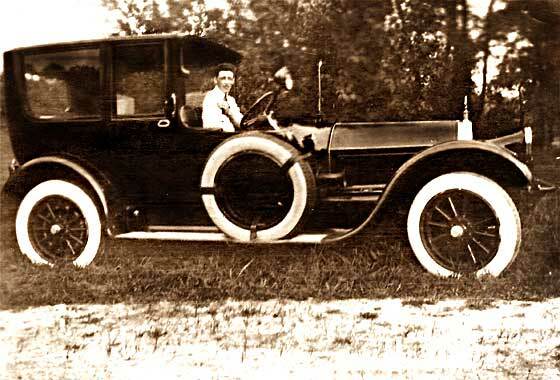 Interesting photo received from Chris Harlow, Colorado (USA) who has been unable to identify his great grandfather's car. The photo was taken ca. 1909 in northern New Jersey (USA). Clues to him: small dimensions of sidelights and protrusion at the bottom of the oil reservoir; lamps mounted high; single bonnet strap; fender flare at the forward edge, mild bend of the front axle -- None of our experts have come up with any ideas. Higher res photo may make out name on rad!